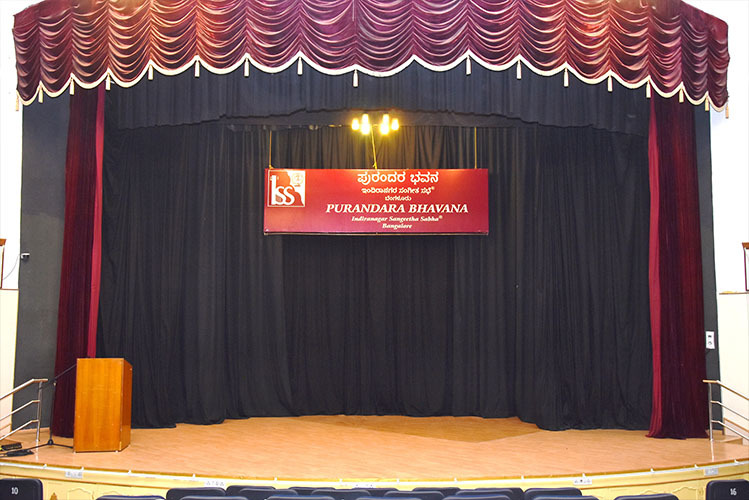 Purandara Bhavana is a multi-faceted Centre for Performing Arts conceived and built by Indiranagar Sangeetha Sabha (Regd. Trust), Bangalore. The Bhavana provides a much needed facility in the eastern part of the city for art lovers along the IT corridor of Bangalore. Built on a 21000 sq.ft. site amidst sylvan surroundings, it provides an ideal ambience for Cultural Programmes, Corporate meetings, Product launches, exhibitions, lecture demonstrations, discourses, annual general meetings, seminars/conferences etc. Ample parking around the building and ease of access add to the convenience of the hosts of these events. The Bhavana has three levels of infrastructure available for hire viz. the Main Auditorium, the Mini Hall and a Lecture Hall to suit the requirements of the above events. The premise is facilitated with power backup. There is also a seperate pantry area for catering refreshments. Main Auditoriurn has been built at two levels. The ground floor accommodates 450 ergonomically designed plush seats and at the mezzanine level, an additional 150 seats adds to a 600 seat capacity. There is room to add another 100 moulded type seats when required. The auditorium has been accoustically treated. The semi-circular stage provides a clear view to the audience and has a power-driven curtain with appropriate backdrop providing aesthetic setting. The lighting system has been designed with special fittings and a dimmer facility to provide a cool and uniform spread. There are additional focus lights for illuminating the stage if required. Special attention has been given to the lobby both in the ground floor and at the mezzanine level for free movement of guests. Properly positioned fans with an adequate air circulation system add to one's comfort. To permit easy access into the auditorium for persons with disabilities and the elderly, a ramp and a side entrance have been specifically provided. Mini Hall is situated in the basement with an independent entrance. Well-lit, and ventilated and ideally suited for meetings, product exhibitions, product launches, ete. Can accommodate 150 persons on comfortable moulded chairs with a 9' x 9' dais. The total carpet area is 2000 sq.ft. and when required this can be extended by using the adjacent hall of 900 sq.ft. for exhibition/display at an additional cost. Lecture Hall located in the basement, well-lit and ventilated can accommodate a minimum of 100 persons in comfortable moulded chairs and has a 9' x 9' wooden dais. For hiring of Sabha's facilities, contact sabha's office.